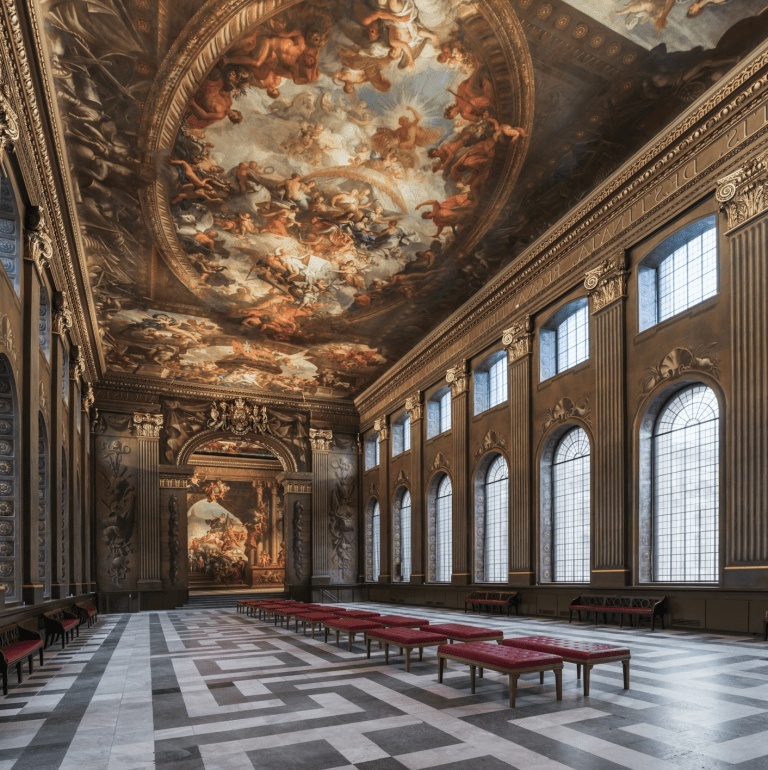 The Painted Hall at the Old Royal Naval College, Greenwich will reopen on 23 March 2019 after a two‑year National Lottery Funded conservation project which has brought its magnificent painted interior vividly back to life. As Surveyor of the Fabric to the Greenwich Foundation, Martin Ashley and the team at Martin Ashley Architects has worked along lead design architects Hugh Broughton Architects on this extraordinary project. The Painted Hall has been referred to as the ‘Sistine Chapel of the UK’ – its vast decorated interior, extending to 4,000 square metres, is the masterpiece of English baroque art. The £8.5‑million conservation project, supported by a £3.1 million grant from the Heritage Lottery Fund (HLF), has reversed years of decay and conserved the Painted Hall for generations to come. Its reopening is part of a major transformation project that will also see the reopening of the King William Undercroft. Situated below the Painted Hall, the newly restored Undercroft space will now house a new café, shop and interpretation gallery, The Sackler Gallery. The Painted Hall is the centrepiece of the Old Royal Naval College, Greenwich. Designed by Sir Christopher Wren as a ceremonial dining room for what was then the new Royal Hospital for Seaman, the Painted Hall was completed in 1705. Its vast decorative scheme by Sir James Thornhill began in 1707 and took 19 years to complete. The paintings celebrate England’s naval power and mercantile prosperity, as well as its newly installed protestant monarchy. Successive monarchs William III and Mary II, Anne and George I join a cast of hundreds of figures, mythological, allegorical, historical and contemporary. The ground-breaking project to clean and conserve the paintings started in 2016 under the supervision of specialist conservators Stephen Paine and Sophie Stewart. Since the last campaign of restoration in the 1950s the paintings have deteriorated, with large areas of ‘blanching’ or whitening covering the surface and obscuring the detail. For two years, a small team of conservators have been working to stabilise and rejuvenate the paintings, with spectacular results. The colour, clarity and richness of the paintings can now be enjoyed, illuminated by a new state-of-the-art LED system. Meanwhile a range of new technologies have been introduced to stabilise the Hall’s environment and ensure the long term preservation of the paintings. The project was also one of the largest open‑access conservation projects in Europe. Between 2017 and 2018 an accessible observation deck gave over 80,000 visitors the opportunity to observe the conservators at work. As the painted surfaces were cleaned, new details were uncovered that revealed how Thornhill planned and executed his vast work. Shadows of corrected details appeared behind later paint layers and large areas of beautifully detailed history painting emerged from behind dirt and decay. The King William Undercroft, a grandly proportioned vaulted space – mirroring the plan of the Painted Hall above and designed by Christopher Wren and his Clerk of Works, Nicholas Hawksmoor – has been lovingly restored to its original form. 20th-century additions, including part of a large modern kitchen, have been removed to reveal the majesty of the space and the beauty of the baroque architectural details. This space, originally used as a day-to-day dining room for the naval pensioners, will now house a shop, café and The Sackler Gallery where visitors can learn about the history and meaning of Thornhill’s masterpiece, prior to ascending into the Painted Hall itself. In the course of works to the Undercroft, two rooms from Henry VIII’s long-lost Greenwich Palace were unearthed beneath a concrete floor, including a cellar containing a series of unusual niches, which archaeologists believe may be ‘bee boles’ for the keeping of skeps (hive baskets) during the winter months when bee colonies hibernate. These remarkable finds have been incorporated into the interpretation area and will be on permanent display to visitors when the Painted Hall reopens. Greenwich Palace was the favoured royal palace of Henry VIII, who was born at Greenwich along with his daughters Mary I and Elizabeth I.